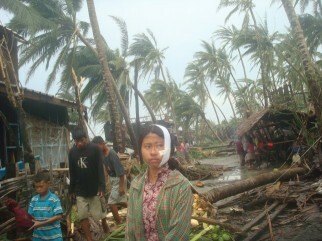 A girl stands injured surrounded by devastation caused by Cyclone Nargis. ‘Heavy rain expected’ was all the regime’s state owned media reported on 2nd May as Cyclone Nargis sped towards Burma with wind speeds of 190km an hour and a three metre tidal surge, bringing death and devastation to the Irrawaddy Delta. But the regime did know what was coming, the cyclone had formed offshore days before, monitored by weather agencies, and the Indian government was so concerned at the regime’s lack of preparation that they directly informed them about the cyclone. To ignore warnings and fail to warn the population of the coming cyclone, or give any advice on how to prepare for when it hit is bad enough, but what followed was even more shocking, though sadly not surprising. As news began to trickle out about the scale of the disaster, the United Nations and aid agencies began to mobilise to help, only to be told by the regime that they were not welcome. In the days after the cyclone, as usual, the regime was blocking news from getting out of the country, and Burma Campaign UK mobilised its underground network in the country to find out the scale of the disaster. Our sources told us that there was barely a house in Rangoon that hadn’t been damaged. That people had no electricity and no clean water, and that there was no sign of any government officials or the army to help clear up the damage. The news from Rangoon was bad, but what worried us more was the lack of any news from the delta region. Burma Campaign UK staff visited the area in 2004, and we saw how vulnerable people would be. Most people live in bamboo houses held together by dried grass. The area is low lying, so very vulnerable to flooding, and many people live by the sea or rivers which would have been badly hit by the tidal surge. Using UN satellite imagery we were able to post maps on our website showing the scale of the flooding, and estimated that 2,000 villages had been flooded. As the regime continued to refuse shipments of aid, Burmese people in Rangoon packed cars and vans with supplies and drove to the delta to help people. They returned with horrific stories of death and devastation, of whole villages empty, or where all the children were gone, having been swept from their parents’ arms by the force of the wind. Bodies were everywhere, rotting in fields and villages. People had little or no food or clean water. No shelter, and no medicine. There regime’s response was to send the army to the delta, not to help people, but to set up roadblocks to stop people going in to deliver aid, and to stop survivors escaping. The Burma Campaign UK helped many journalists get news out to the world about what was going on. People in Burma called for aid to be delivered without waiting for permission from the regime. Permission will never come they said, and thousands of people will die because of lack of aid. China was also blocking moves for the United Nations Security Council to authorise direct aid delivery. We lobbied the British, French and American governments to use their Navy ships in the area to go in directly and save lives. The Conservative Party and Liberal Democrats backed our call, and the government said they would not rule it out, but France and the USA refused, and the UK didn’t have the capacity to act by itself. As international outrage grew, the regime resorted to the same old tricks it has used to fool the international community about political reform. First they made some small concessions, allowing plane loads of aid in, but then they seized that aid. This provoked a stronger outcry and they began to allow more planes in, but not the aid workers or helicopters or boats needed to deliver the aid. 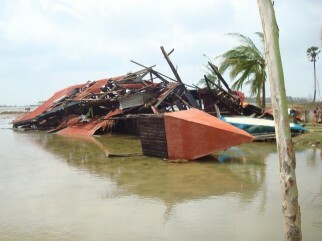 Two weeks after the cyclone had struck, most survivors still hadn’t received any assistance. At last, UN Secretary General Ban Ki-moon, who had repeatedly refused to go to Burma to try to persuade the generals to allow in aid, left for Burma. He appeared to have negotiated a deal to allow aid workers in, but once again the regime had lied to the UN. They granted more visas, but not nearly enough to deal with a crisis on this scale. In the week after the much-hailed agreement, the regime was still turning down visas for aid workers, access to the delta region was still restricted. Even those aid workers that did get visas arrived in Rangoon only to find there were not allowed to leave the city. They had to apply for permission to leave 48 hours in advance. A quarter of those requests were refused by the regime, but the UN, wanting to claim a success, failed to speak out or increase pressure for the free access needed to save lives. A church destroyed by Cyclone Nargis in the Irrawaddy deltaThe regime set up show camps to try to fool the world that they were taking action. Cyclone survivors were brought to the camps in advance of visits by international visitors such as European Union officials or the UN Secretary General. As soon as the visitors left, survivors were forced back to their devastated villages. Where the international community saw cyclone victims, the generals began to see dollar signs. They soon realised they could turn international sympathy to their advantage. At first they simply stole aid, but they realised there were greater opportunities in accessing aid for reconstruction. They allocated all areas of the delta to different businessmen, regime cronies who help keep the regime afloat. These cronies were to help with reconstruction in their area, paid for, they hoped, by international aid. The generals could expect bribes and other benefits in exchange for these lucrative contacts. The regime called for an astonishing $11.7bn for reconstruction. The delta region is one of the most fertile parts of Burma, and the regime was no doubt delighted that it has been ‘cleansed’ of many ethnic Karen who lived there, and could now be turned over to their business friends. This may also have been a factor in the regime blocking aid to many of the rural areas of the delta, which are predominantly Karen. The regime worked hard to break down the restrictions put in place by the international community to prevent aid going through the regime or their cronies. Sadly, some aid agencies have gone along with the regime in this. Save the Children have been working closely with Serge Pun, a regime crony who is involved in a biofuel project that is impoverishing Burmese farmers. Shockingly, Save the Children even gave aid equipment supplied by the British government to the regime. The Burma Campaign UK is very concerned that actions of this kind could compromise the impartiality of aid and discourage people from donating. A month after the devastating cyclone in Burma, an estimated 2.4 million people remained in urgent need of aid because the regime denied aid workers free access to operate in the areas most severely affected by the cyclone. Even those who were getting aid were not receiving the full package of aid. While we will probably never know how many people were killed, estimates are as high as 200,000 dead or missing and more than one million people are believed to be homeless. The question now is whether the international community will hold the regime to account for yet another atrocity, killing thousands of people through denying them aid, or will things return to business as usual as they did after the uprising last year? List of private companies assigned responsibility by the regime for post-Nargis reconstruction work. To view pdf documents download Acrobat Reader free. View images of Cyclone Nargis in Burma here.